ICI offer a complete range of IR cameras suited to the Thermography market. The IR-PAD series of products utilize a 320 or 640 resolution Thermal Core which has been fully calibrated by ICI engineers and is incorporated into a Windows based Tablet PC. Coupled with this hardware is ICI's Flash Thermography suite which allows the user to complete an instantaneous and accurate Thermographic report from a single device, making the IR-PAD one of the most flexible Thermography devices available on the market. The ICI IR-Pad 640 P-Series infrared camera and tablet system is perfect for capturing 640x480 images. It is ideal for indoor use and is superior for outdoors in the work field as well. This ultra rugged IR-Pad 640 uses the ICI 9640 P-Series infrared camera to capture all of your thermal images. The ICI IR-Pad 320 P-Series infrared camera and tablet system is perfect for capturing 320x240 images. It is ideal for indoor use and is superior for outdoors in the work field as well. This ultra rugged IR-Pad 320 uses our ICI 9320 P-Series infrared camera to capture all of your thermal images. 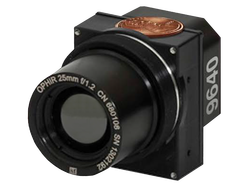 ﻿The ICI 9640 P-Series infrared camera offers unmatched image sensitivity and accuracy in a 640x480 radiometric imager. The ICI 9640 operates on less than 1 watt of power, via a USB 2.0 connection, providing real time radiometric data streamed directly to any desktop, laptop, tablet or embedded system﻿. The ICI 9320 Infrared Camera offers unmatched image sensitivity and accuracy in a 320x240 radiometric imager. The ICI 9320 operates on less than 1 watt of power, via a USB 2.0 connection, providing real time radiometric data streamed directly to any desktop, laptop, tablet or embedded system.